Advantages: Effective layout, appealing artwork, over 170 illustrations with almost as many 3-view drawings, ideal quick reference guide. 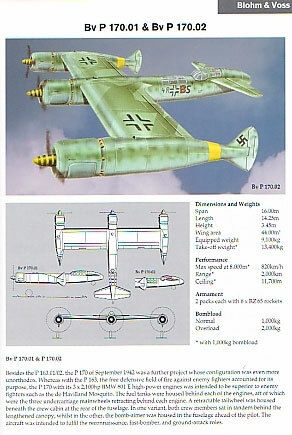 Midland Publishing is certainly no stranger to the imaginative designs of the German aviation industry. Their highly successful “Luftwaffe Secret Projects” series showed just how diverse and innovative the thinking was during those last years of the Third Reich. Whilst other publications have concentrated on the developmental and technical aspects of these designs, this book chooses a different path. Essentially this is what the author calls a “picture book” and his aim was a quick-reference guide to the various projects being put forward. Thus the reader can look up the manufacturer’s proposed design and instantly get a visual representation of the aircraft on offer. This has been made possible by the countless pieces of artwork in the book. Each design is graced with a painting of the aircraft in flight so as to allow the viewer a true understanding of what the proposal would have looked like. These illustrations are excellent and it is obvious that the artist had a lot of fun choosing the various camouflage schemes and insignia. He has also managed to create a sufficiently different background for each aircraft to maintain the reader’s interest. Complimenting this work, there is some brief selected text to give an overview of the subject being presented. The author has kept this to a minimum in keeping with the style of the book. This is commendable as there are other publications that already deal with the descriptive and technical prose in sufficient depth. Besides, repetition here would be a diversion from the books main purpose. Technical data is not forgotten though and a table of the relevant information is included. Where possible, this data includes dimensions, calculated performance, powerplant, armament and weight. This is done in such a way that comparison between various subjects is a breeze. The projects contained within this collection are fighters (both day and night), Zerstörers and ground-attack aircraft. 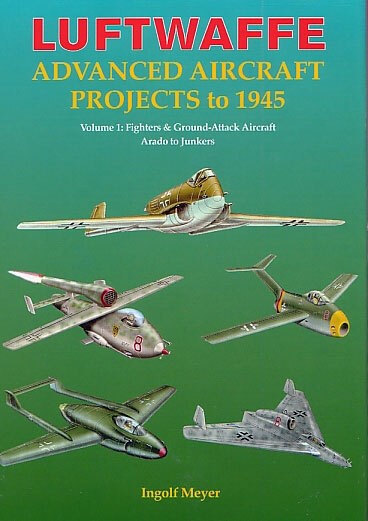 They are arranged alphabetically according to the manufacturers that conceived them, with this volume covering Arado to Junkers. A companion volume will cover the manufacturers from Lippisch to Zeppelin. This hard cover book contains 192 pages, printed on A4 gloss stock. Individual subjects are confined to a single page each but on occasion a variant will spill over to an adjacent sheet. Each proposal comes with its own 3-view drawing. Obviously there could be no uniform standard for these as in many cases the original factory items are incomplete. Enough is provided though to allow the reader an excellent understanding of the proportions involved. This book clearly succeeds in its aim. The author has written and illustrated a quick lookup reference book that is both uncluttered and simple to use. Its clever layout means that the aircraft’s pertinent information can be seen at a glance and easily compared to other designs. The artwork is visually appealing and this is the crux of the volume. It’s an ideal compliment to previous publications that devote themselves to the more technical and descriptive accounts of those “what might have been” aircraft.